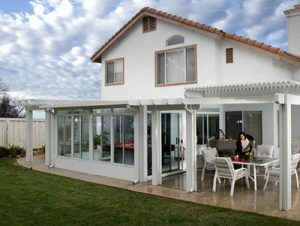 Taking full advantage of Southern California’s great weather all year ‘round is easy with a beautiful patio enclosure from Hausner Construction. It’s like adding another room to your home! 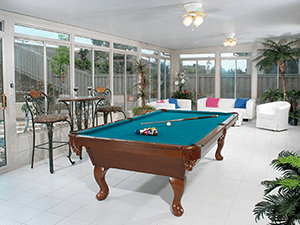 A patio enclosure creates many opportunities for you to make full use of your outdoor patio space. Invite friends and neighbors over for a fresh air meal. Spend quality outdoor time with your family. Or simply sit and enjoy the tranquility of a Pacific sunset from the comfort of your own patio. Our patio enclosures are a treat for the eye, with attractive styling that blends seamlessly with your home’s décor, making an integral part of the architecture. Yet they provide sturdy protection from the sun, rain and pesky insects that may otherwise interrupt a pleasant day on the patio. Your new patio enclosure will be custom designed and built to fit your needs and your home’s style perfectly. We offer virtually limitless options, including elegant lattice patio covers, simple and affordable screen enclosures that are quick and easy to install, or more extensive “outdoor rooms” that can include lighting and electrical service and energy-efficient thermal glass to provide true four-season comfort. Choose from interior finishes that include aluminum, vinyl or natural wood. Hausner Construction installs patio covers and patio enclosures in San Diego, Los Angeles and surrounding areas in Southern California. We are certified by the top-rated manufacturers in the industry, including Four Seasons and Duralum, who back their products with lifetime warranties. Start enjoying outdoor living with indoor comfort, with a patio enclosure from Hausner Construction, the leading Southern California home improvement contractor. Call us today at 800-698-2005, or complete our convenient online request form to get a free, no obligation estimate.